Unlike ropes, shoes, and harnesses, our climbing protection will last through years of use and abuse. 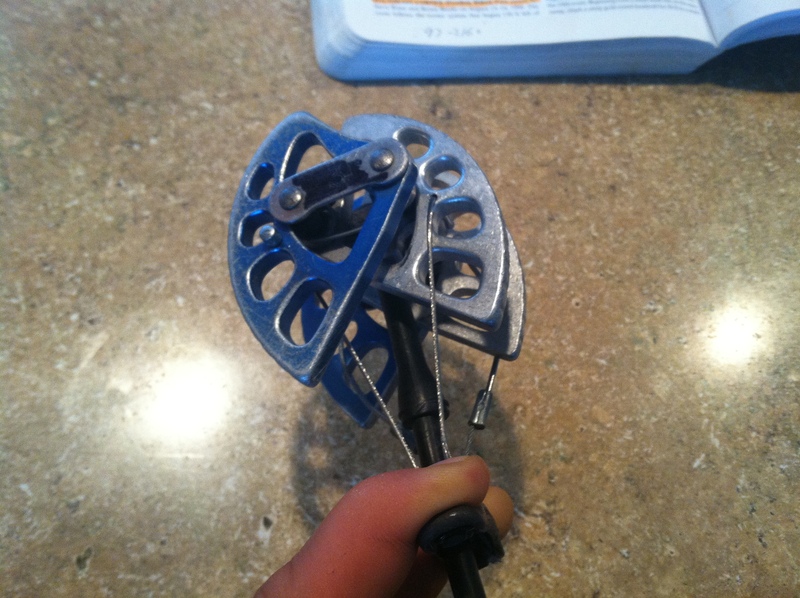 I still regularly climb on a purple Metolius TCU which is older than I am, but which I have replaced the webbing on. And other than the webbing/slings on cams, which can be replaced by the company of manufacture, with a bulky hand-tied version, or a via third party such as Yates, the only other frequent mechanism of failure is the trigger wire. Fortunately for those who are loath to spend money, or like a little DIY challenge (you’re a climber, aren’t you?) it is easy to make a durable and free repair to the trigger wires of cams. Trigger wires are not part of the cam’s actual holding function, and don’t bear any weight apart from the force of your fingers as you pull back on the lobes. If a trigger wire breaks, a placement will not fail but will (almost certainly) become permanently stuck. For this reason, at-home tinkerers don’t need to worry about their efforts jeopardizing anyone’s safety. Each cam model and size can be fixed in a different way, but there is a simple and standard method to fix most medium and large cams, involving a quick stop at your local bike store. 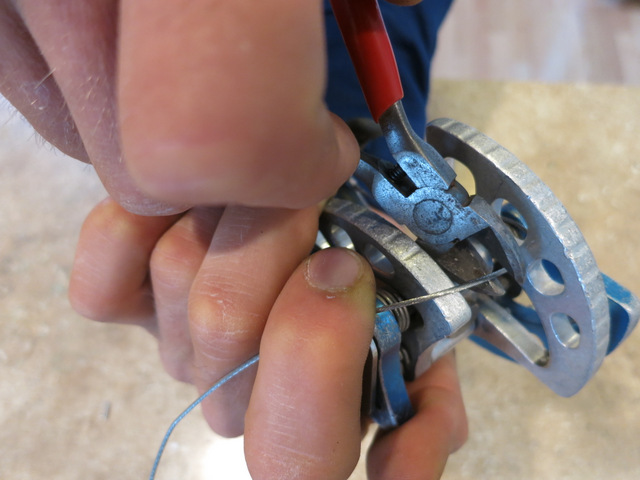 Fortunately for climbers, the three most popular styles of medium and larger cams (#.75 camalot and up) all have nearly identical trigger wire designs, and repairing them is a breeze. These are the BD Camalot, the DMM Dragon Cam, and Wild Country Helium Friend. Each of these models uses cable connecting the 4 lobes to a plastic trigger bar. 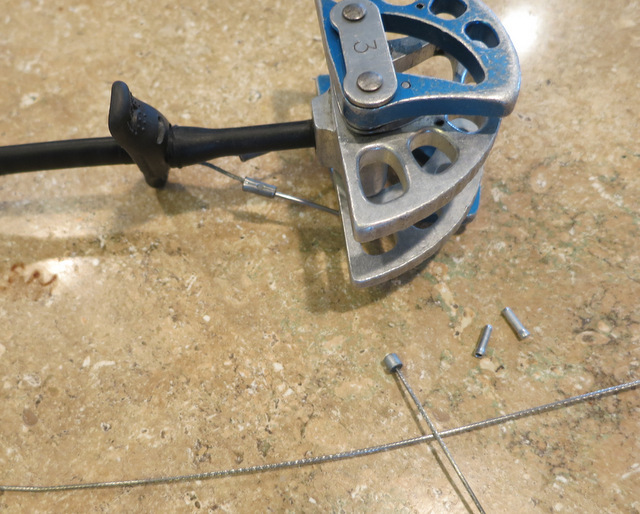 If and when the cables on these cams become frayed, grab a 1′-2′ piece of bike brake cable (when I walked into my local shop, the employee happily handed me an extra long piece out of the garbage can) and 2 small end/crimp caps, such as are put onto shifting and brake cables of a bicycle. These should also be free, or cost just a few cents. If the bike shop has a piece of cable with a built-in larger “stop” or “cap” already attached, that will save you a quick step. You’ll also need just a single pair of needle-nose pliers which also have a sharp section for cutting wire. Cut away and remove the old cable. You may have to bend the more solid bits of wire into straight lines, and push them through the lobes. Any wire cutters should work, but sharper ones help make clean cuts. Apply one of the small crimp caps to the end of your way and smash it solidly onto the cable. This is now too large to pass through the cam lobe. Thread the (thin and sharply-cut) other end of the cable through the cam’s lobe, through the trigger bar, and back out the trigger bar in the direction it came from, and then through the remaining cam lobe. While holding the lobes “closed” to produce some slack in your connection, cut off the cable just a few centimeters beyond where it has passed through the cam lobe. If you don’t have a second set of hands to hold the lobes down while you do this, you can wrap some athletic or electrical tape around the cable as a temporary “stop” while you figure out where to cut the cable. Apply the second crimp cap to this new cut, and bend it down along the cam’s lobe as much as possible. Go climb. 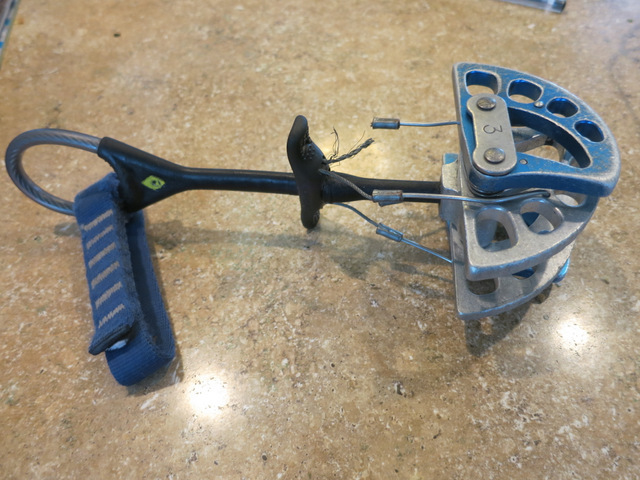 Disclaimer: Cascadeclimbers.com and all its associated entities does not assume responsibility for the repairs you make to your climbing gear. Use these instructions at your own risk. If you doubt your own repair job, please seek advisement from the gear manufacturer. 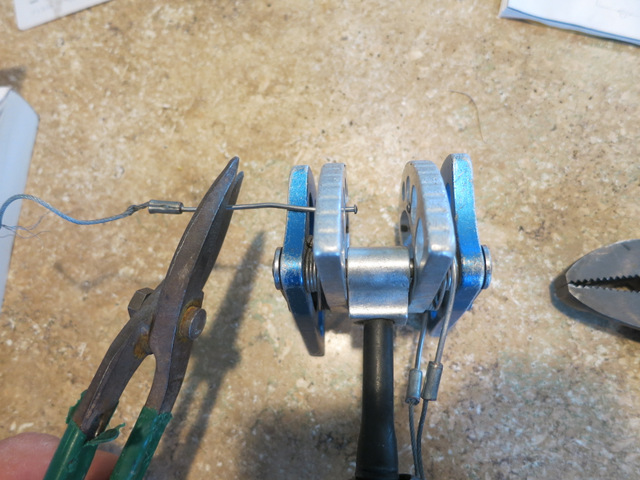 a similar fix can be done with weed wack wire and instead of a crimp for the end, melt the end into a small knob. I have some cams with 10 years of use on the same weedwack string.